The first Room 13 in Cape Town is based in Kewtown Primary School in Athlone. It was opened in 2008 with support from TBWA \ South Africa. The studio has developed to accommodate a growing number of dedicated students, who explore different forms of art such as painting, drawing, poetry, storytelling, performance, drama and the use of recycled material. Learners are encouraged to express themselves through whatever means they feel comfortable with, and as a result the studio serves as a space for frustrated youth to vent their anger in a constructive way. The community the school is in suffers from the effects of drug abuse, alcohol abuse and gang warfare. The studio offers a lifeline to the young people who are brave enough to seek an alternative to the life they may be exposed to. 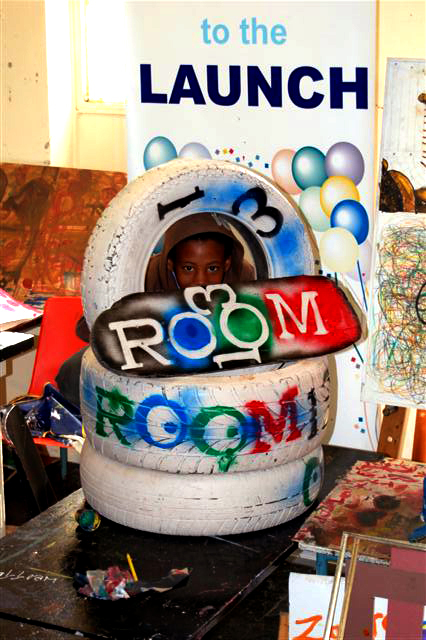 Room 13 Kewtown runs a yearly programme to coincide with that of the school. As well as supporting the ongoing artistic and business development of the learner, the studio supports studies by organising a different themed project each month. Recent themes have included human rights, South African citizenship and the World Cup. “Some learners will just sit in the studio space without picking up any art material but he or she will just talk, getting things off their chest. This demonstrates that Room 13 also serves as a space for frustrated youth to vent their anger. The area or community where the school is situated is in the heartlands of the Cape flats. Even though Kewtown carries stories of great important and significance, and is a place that gave birth to great political icons, jazz musicians and famous actors and singers, unfortunately the good is overlooked and instead the local newspaper is flooded with stories of drug abuse, alcohol abuse and gang warfare.